The importance of fostering trust and community applies to all stages of an organization, from top management, to teams of employees, to a wide audience of customers. In this episode of Mastering Innovation on SiriusXM Channel 132, Business Radio Powered by The Wharton School, Jennifer Dulski, Head of Groups and Community at Facebook and author of Purposeful: Are You a Manager or a Movement Starter?, revealed how managers must listen to both customers and employees to build connections and encourage change. Dulski first explained how Facebook Groups aims to give its users a true sense of connection and belonging despite potential differences in background, location, beliefs, and more. Her team speaks directly with real people who use the product, supplementing that feedback with data trends and user behavior to provide new tools that enhance the overall experience. Similarly, managers must communicate and connect with their teams to work efficiently as a cohesive unit and community. Some tools she offered were a “motivational pie chart,” in which each person lists and weighs factors they care about and are motivated by, and a “user manual,” in which preferences in receiving feedback or other work behavior are laid out. Ultimately, Dulski found three common themes resurfacing: purpose, growth, and connection. She further discussed these, along with other findings in her book, to conclude that managers who can go the extra mile to become movement starters see and promote the most success. Nicolaj Siggelkow: You mentioned the word “purpose.” Let’s use that to segue into your book, Purposeful: Are You a Manager Or a Movement Starter? From the title, it seems to imply that one doesn’t want to be a manager. That word probably means something particular to you in this title. Can you clarify? Jennifer Dulski: That’s right. I certainly don’t want to suggest that people shouldn’t be managers and that we don’t need managers in the world, because they’re very valuable. I, myself, am a manager, and I have been for a long time. What I’m trying to suggest, though, is that being a manager by itself is not as far as we can go. Being a manager, you can say, “We’re doing all we can.” Being a movement starter, you might say, “There must be more that we can do.” Managers who essentially become movement starters are the ones that I see being most successful. They’re the ones who can take a vision and make it a reality, who can mobilize people around a purpose and make it happen. Siggelkow: I can hardly think of anyone who would be in a better situation or position than you to observe this formally, being COO of Change.org, and now at Facebook Community. What are the elements that you have seen in how people have started movements? Dulski: The really interesting thing about movements is that they all generally start with a single person or a very small group of people, and they all start with a pretty small step. People don’t wake up one day and just get out of bed and then they’re Nelson Mandela. They start with pretty small steps. That was the most surprising thing to me. The interesting thing is most people haven’t. You might say, “People just have a high bar for entertainment,” and that could be true, but I think that for the most part, people don’t do it because it’s a little bit scary. It exposes yourself to say, “I’m going to stand up in front of everyone and say I liked this a lot, and I want people to join me.” That’s what starting a movement is like. You take that first step, and you ask other people to join you. It feels scary no matter how small the steps might be. Sometimes, it’s an email to your friends. Sometimes, it’s a post on Facebook. Sometimes, it’s starting a petition on Change.org or elsewhere. It feels scary. The successful movement starters are the ones who can get over that fear and make it happen. Siggelkow: You have wonderful examples in your book, and as you said, you have very, very different types of examples. Thinking about this in an organizational context, how many movement starters do you want to have in your organization? Siggelkow: As you said, movements can start small and then become very large, but the topics of the movements can also be smaller or larger. What I really enjoyed in reading your book is that you also talk about teamwork. Thinking about it at an even more micro level, can you share with our listeners some of the things that you’ve learned about building teams and creating bonds within teams? 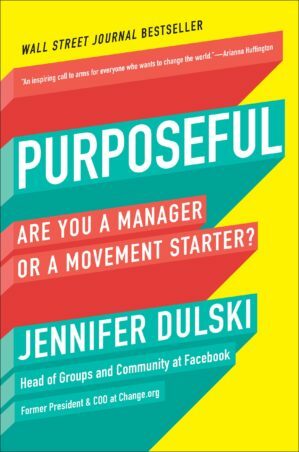 Dulski’s Latest Book, Purposeful: Are You a Manager or a Movement Starter? Dulski: Sure. One of the stories that I tell in Purposeful is that a lot of the leadership lessons I learned about building strong teams came from being a coxswain on the rowing team in both high school and college. That role, for people who don’t know, is the person who sits in the back of the boat and steers, but also strategizes the race and coaches the rowers from inside the boat. I learned a few key lessons about creating teams that were really important then, and they translate really well into larger organizations. We want people to give us feedback to make us better. Each person is motivated by different things. I found, for instance, that some people preferred feedback to be really direct. They just wanted me to say, “Your oar is not going in the water straight. You need to be faster.” Other people really disliked that, and they wanted feedback more in terms of, “You’re doing so well. Just a little bit faster,” and that was better for them. So, understanding people’s different needs really helps the team come together. Siggelkow: It’s interesting because you talked about understanding what drives you earlier. Now, it’s understanding what kind of feedback the individuals who work with you and for you need. What are some techniques? You talked about the motivational pie chart as one practical tool that you used to elicit some of that information on the feedback side. How do you gauge that? Sitting in a boat, that’s one thing. How do you do it in the real world, in the workplace? Dulski: Another thing I will say about the rowing analogy is I would try out a “test and learn” approach like you might do in a workplace. For instance, when I was coaching people on the rowing machine outside of the boat, I would try different techniques, and I could see which ones would work better on which people. So, there’s that aspect. The other thing is just asking directly. Similar to the pie chart, we have an exercise we use called the user manual. Imagine we were each a microwave oven or a refrigerator that came with a user manual. Wouldn’t it be so much easier if we just told each other the things that we like and don’t like in the workplace? Our pet peeves, etc. I actually do an exercise with most teams where we go through that process, and we say, “What are your pet peeves? What’s the best way to earn your trust? What’s the best way to give you feedback?” I’ve learned amazing things about people in that process. Jennifer Dulski leads Facebook Groups, a product used by more than 1.4 billion people to create and participate in communities that matter to them on topics from parenting to health to passionate hobbies to mobilizing around disaster response. Prior to Facebook, Jennifer served as president & COO of Change.org, a social enterprise company that empowers people everywhere to start and win campaigns for change. Under her leadership Change.org grew from 18 million users to more than 180 million, and thousands of social change campaigns were successful around the world. Jennifer was an early Yahoo! employee, holding a variety of roles over her 9-year tenure to ultimately lead one of the company’s 6 business units as group VP and general manager of Local and Marketplaces. She left Yahoo! 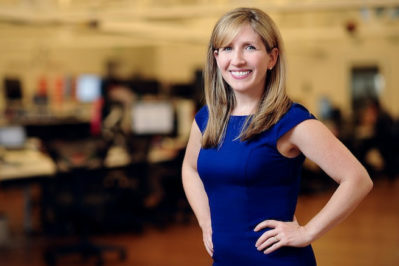 to become co-founder and CEO of The Dealmap, a location-based deals site that Google acquired in 2011, making Jennifer the first woman to sell a company to Google. She stayed at Google for nearly 2 years before joining Change.org.